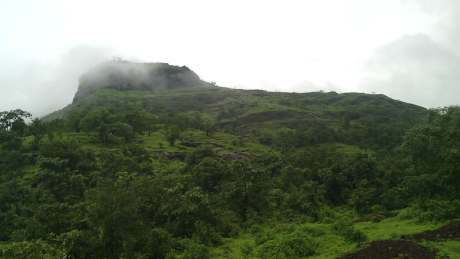 Sondai is not a fort but a small mountain in Karjat region (Matheran range). The top shelters the temple of Goddess Sondai. The 45 minutes are sufficient for climbing the mountain. There are about three to four water tanks on the mountain. How to reach: Karjat ST bus stand is at a walkable distance from Karjat railway station. At the bus stand ask for the bus with destination Chowk or Murbad, that goes via Borgaon-bypass or Borgaon-phata (बोरगाव फाटा). The frequency of buses is good and it takes about 15-20 minutes. Karjat to Borgaon bypass is 7 km and bypass to Sondewadi is another 6 km. There is no direct bus to Sondewadi village (as of 2015). For a larger group (>7) private tum-tum can be arranged from Karjat itself. Although, no such service would be available for return journey from Sondewadi. If lucky, you might find some transport from Ambewadi bypass road (the bypass that goes to One-tree hill Matheran). 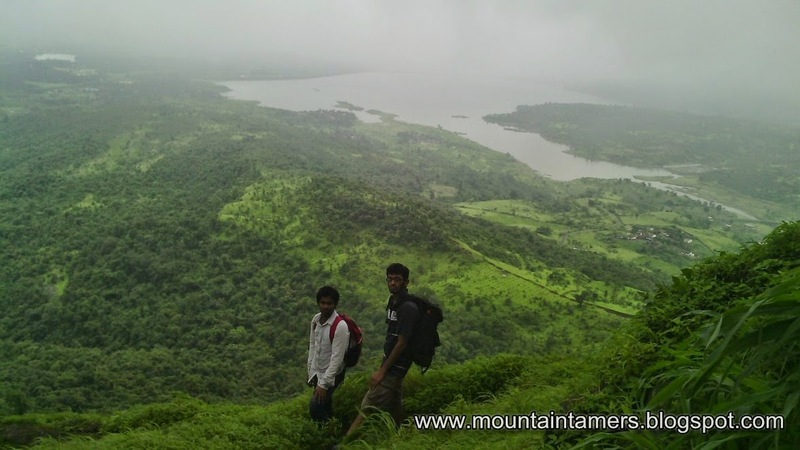 There are 2 trails to reach the top, one from Wavarle and one from Sondewadi. The trail from Wavarle has a long traverse along the mountain, that meets the Sondewadi trail at the top (much before the tanks). As a general supposition, it was to be a simple walk on the twisting road along the Morbe (मोर्बे) backwaters, with an estimated climb-time of 45min. to 1.00 hr. from Sondewadi (सोंडेवाडी). But one wrong turn made it a 2hr climb. This was from Sondewadi. 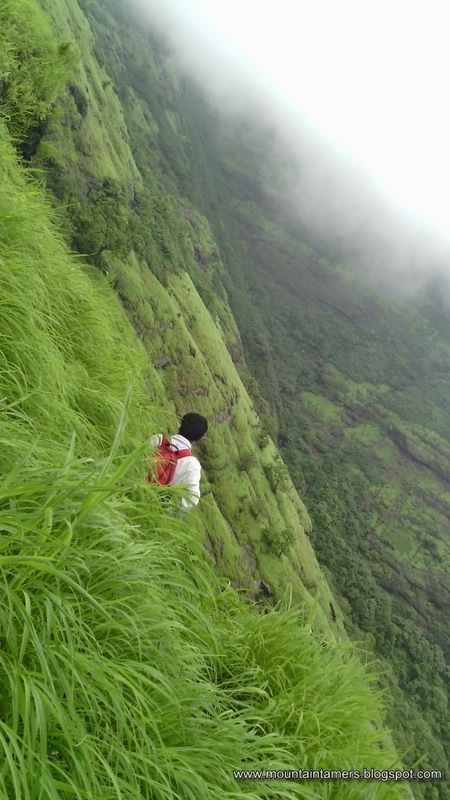 To reach Sondewadi itself, one needs to walk for 1 to 1.5 hrs. Transport was available, but we preferred walking the 5 km patch all the way to the base of the mountain. The flowing rivulets, breezing wind from the gigantic reservoir clubbed with gentle rain showers added a completely different flavor to the walk. The 50 shades of greenish groves, chirping of the several hundred birds, the yellowish vegetation with red-orange colored flowers making their way out of the shrubs, the herd of cattle lying lazily in the muddy pond- how often you get to experience such moments ? It was 10.30 AM when we started our climb. With the clouds still looming over, rains showed no sign of abating. From the col we headed-up straight, almost circumambulated half the hill, and then climbed from back. 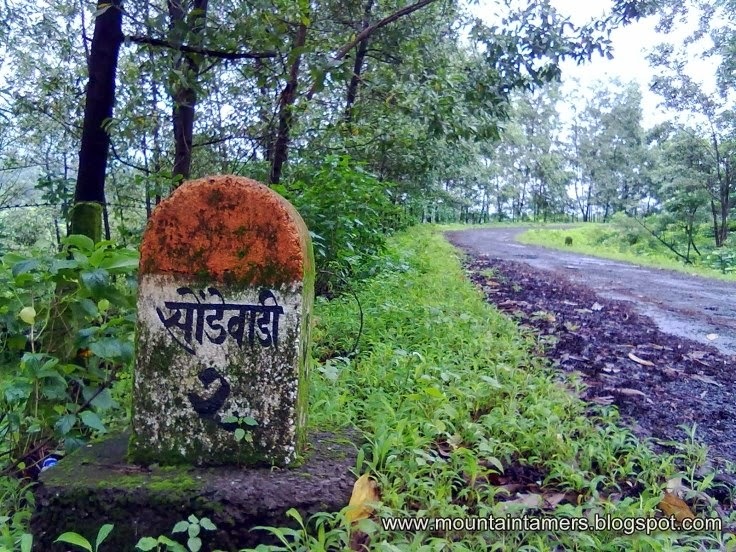 The one trail which appears to descend down the forest goes to the Wavarle village (वावर्ले) via the Wavarle dam. So, to wind-up, we started from Sondewadi and ended up climbing the trail from Wavarle which consumed much of our time. At the plateau there are two water cisterns dug out from the stone. Above that, lies a 3-5 mts tall rock, followed by a newly built metallic ladder. Just after the ladder, there is a square water tank dug inside the stone wall and lies exactly on the edge of the trail. 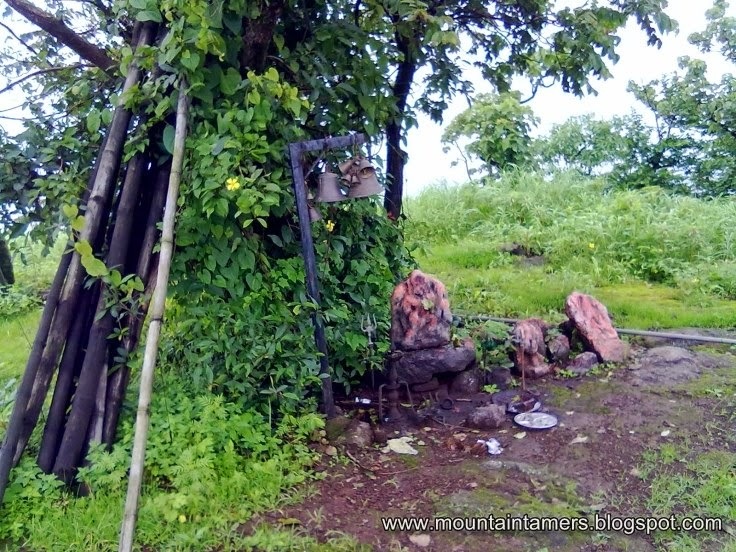 The trail goes right up to the top of the mountain where we found the idol of local goddess Sondai Devi (सोंडाई देवी) and other stone sculptures of other deities underneath a tree. The final part is a bit exposed to valley, but quite manageable. 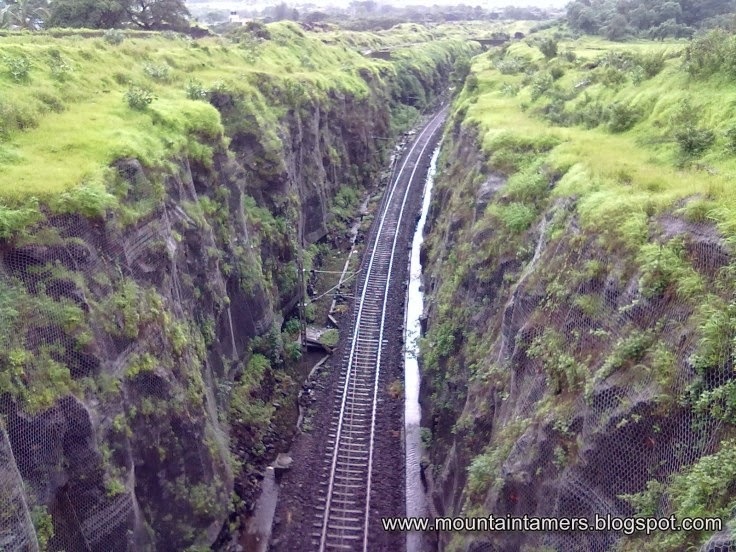 This mountain protrudes out from the main Matheran rage and has a height less than that of the main range. Sondai Devi is worshiped by the locals from the nearby villages and the top is maintained by them. A glance from above shows the expanse of the Morbe dam and Wavarle reservoir. We took the descend route to the Sondewadi village (and not Wavarle) and because of which we reached the base in a whooping 25 minutes. And as we approached the village the school kids took us to a nearby waterfall. The clock ticked 3.00 PM as we took the road back to karjat station. We could spot Manikgad far off, then silhouettes of Karnala, Irshal pinnacles, Kalavantin-Prabalgad, One-tree hill (Matheran) along the road. 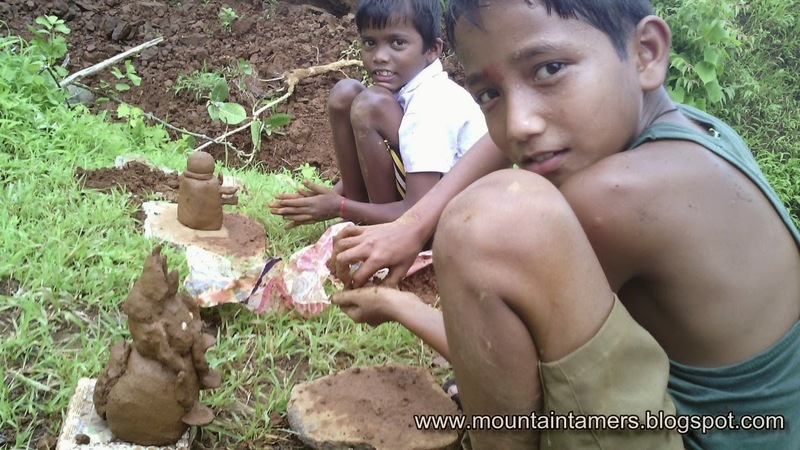 We met these two kids near the waterfall, deeply engrossed in mud-sculptures (we kind of disturbed them). They said "शाळेसाठी आम्ही अश्या लहान लहान गोष्टी बनवतो. आम्हाला मजा येते". A perfect end of a typical monsoon trek! The route cannot be missed. We preferred walking from the Borgaon phata, all the way till Sondewadi. Some people prefer shared jeep and autos from Karjat itself, which for us, was very expensive.